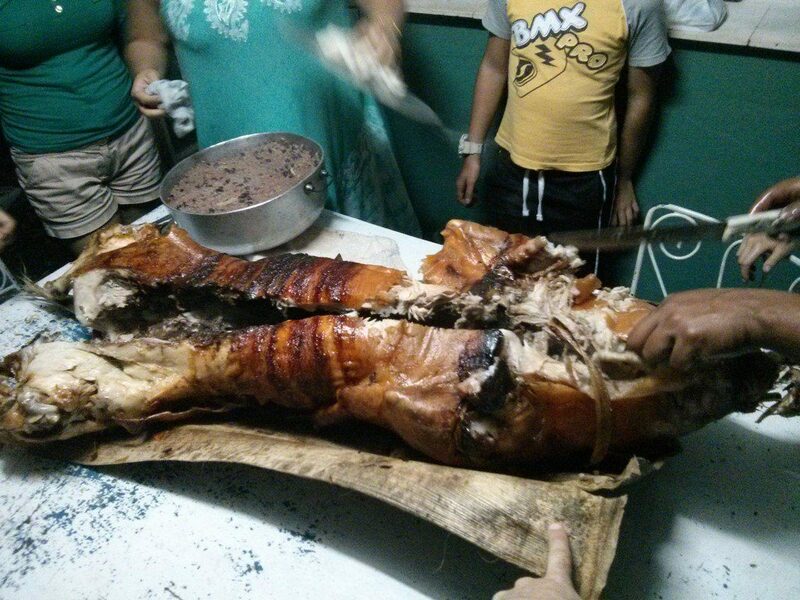 A slow cooked, roasted Cuban pig is one of the most traditional Cuban foods and cooking styles you can get. There is a lot of preparation involved and a whole day of cooking, but roasting a pig on an outdoor fire pit is a great way to celebrate a special occasion and to feed a big gang of people. 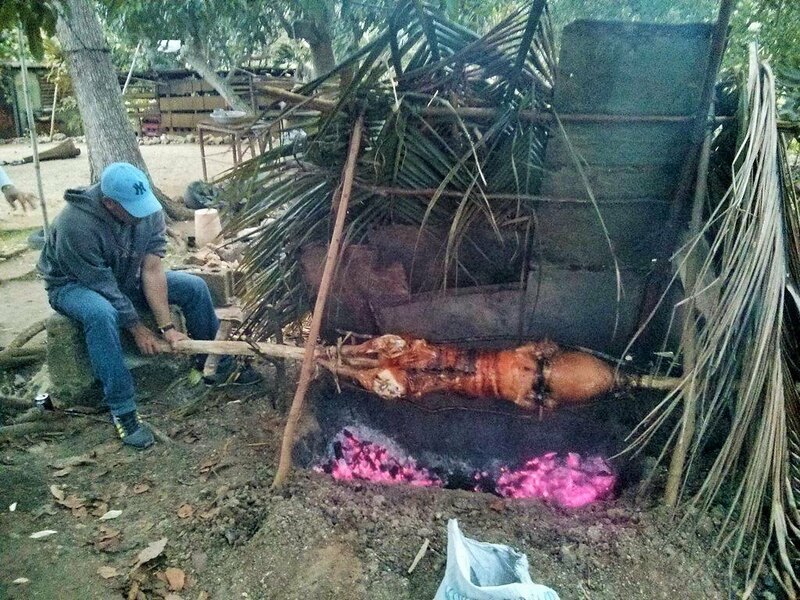 I had the great privilege to host a pig roast with a few of my friends in January 2018. 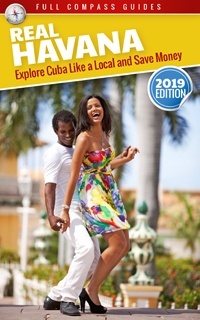 I want to share this experience with fellow Cuba enthusiasts. 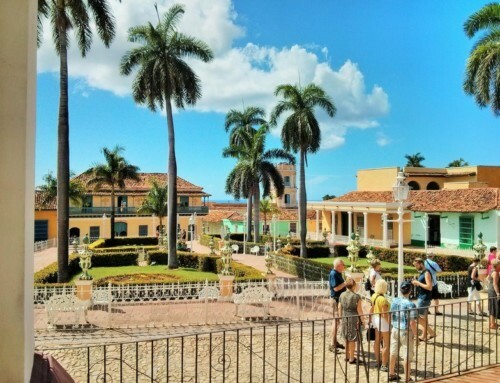 My friends have a house in the Cuban countryside, near the port of Mariel. It’s a relatively isolated area with rolling hills, prairie land for grazing animals and dormant farms. 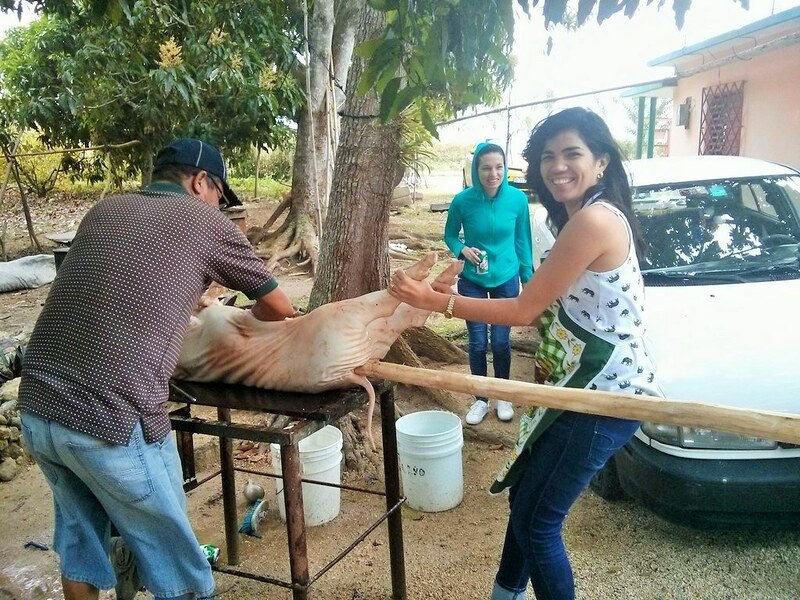 They offered their location to host a pig roast, and I offered to buy the pig. 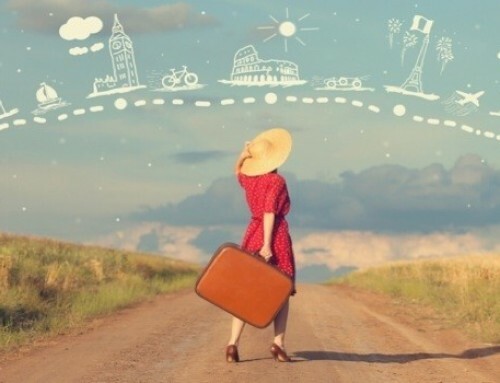 It did not take much to set the plan in motion. Normally you can get a small (50 to 60 lbs) pig for about 40 CUC (1000 MN). These piglets are particularly popular for Christmas and New Years parties. A local farmer had a few dozen pigs which he was raising. He had raised the pigs to sell for Christmas, but he had a few left over. Being January, these piglets had put on a few extra pounds and now weighed over 100 lbs. 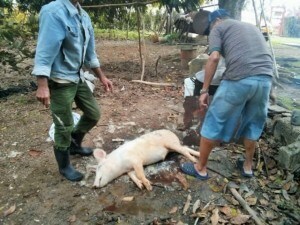 I got a beautiful, plump piglet weighing just over 110lbs for 80 CUC (2000 MN). It was much more meat than I needed, but that just means we were going to host a larger party. Not the actual pig, but very similar. I don’t have photos of this part, sorry. But my friend drives a 1993 Nissan Sentra and honest to God, the pig just hopped into the back seat and casually looked out the window as we took him home from the farm. 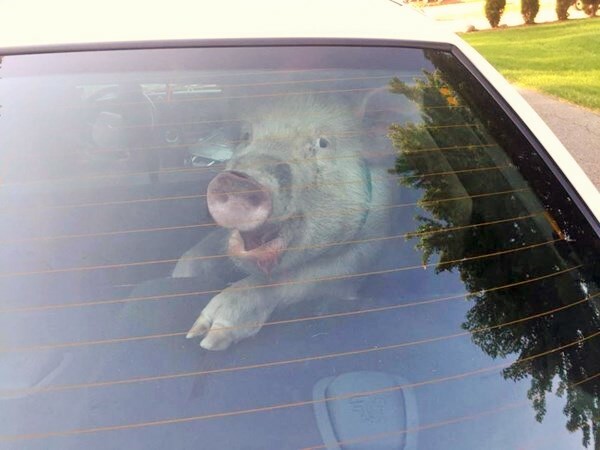 Pigs are rather intelligent and I suspect he knew his fate, but he also seemed to enjoy the car ride. 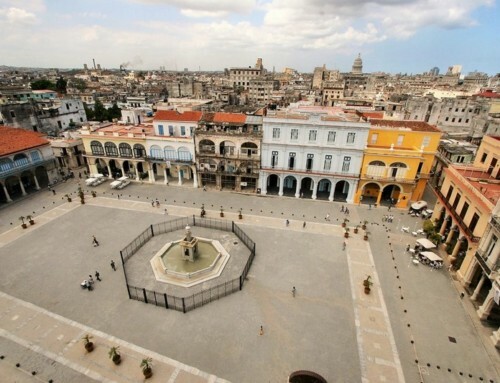 A pit was dug in the bare soil, about 2 feet deep, 2 feet wide and 5 feet long. 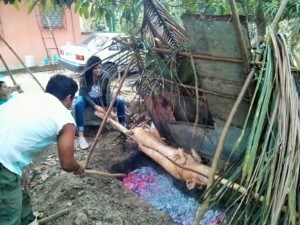 Two sturdy sticks (one on each end) were inserted into the ground and the ends of the pit. These sticks were in Y shape and would serve to hold the spit roast over the fire pit. A small amount of charcoal was added to the pit and ignited. 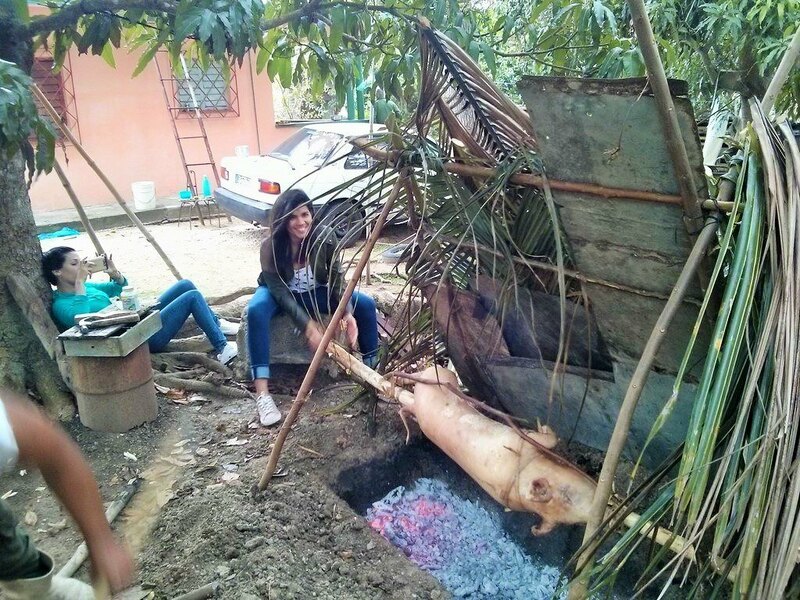 It was a very windy day, so a small wooded structure was made over one side of the pit with some palm leaves added to the sides to act as a wind screen. 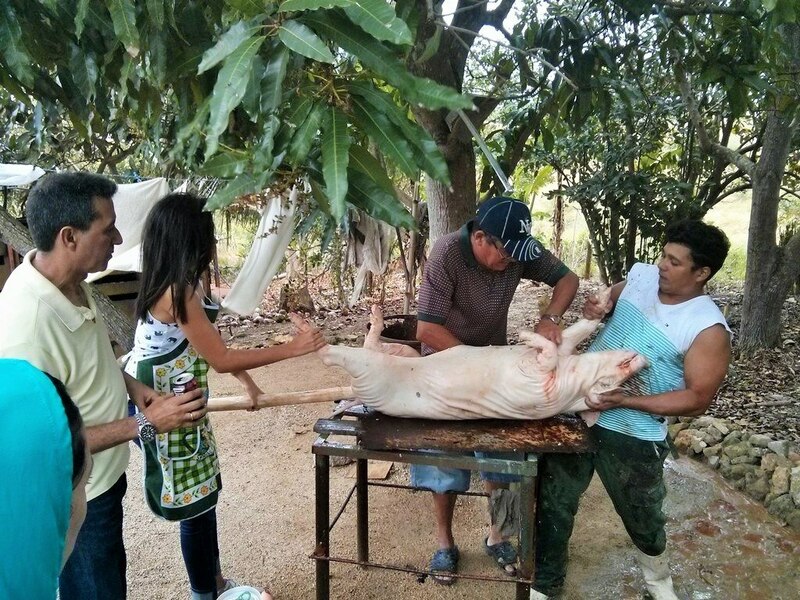 The next morning, the piglet got the knife. My friend delivered a sharp stab to the pigs heart and he died instantly. The blood was collected for making sausages. We made a fire and boiled a large pot of water. 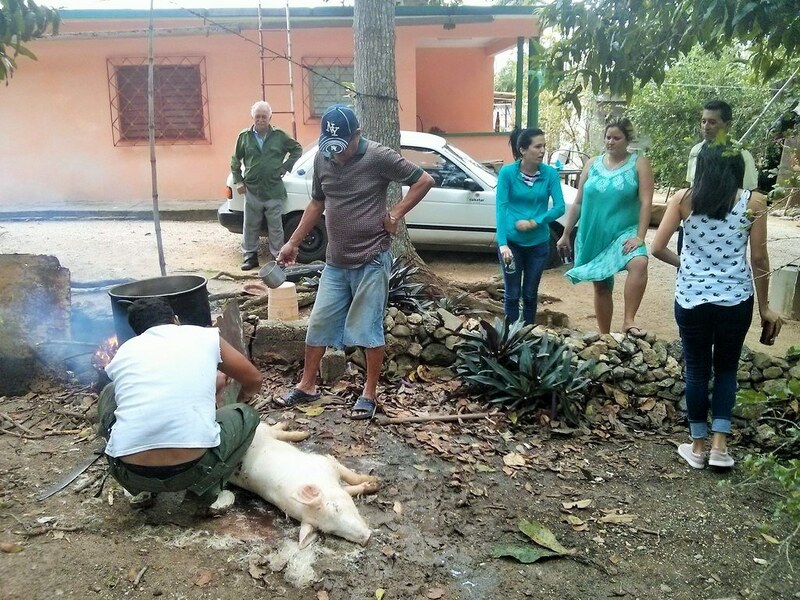 With a scoop, we poured the boiling water over the pig and used a knife to scrape off the hair and the rough outer layer of skin. This was a long process, taking about 2 hours. But once done, we had a perfectly pink, smooth piglet. This part involves a good deal of skill and patience. 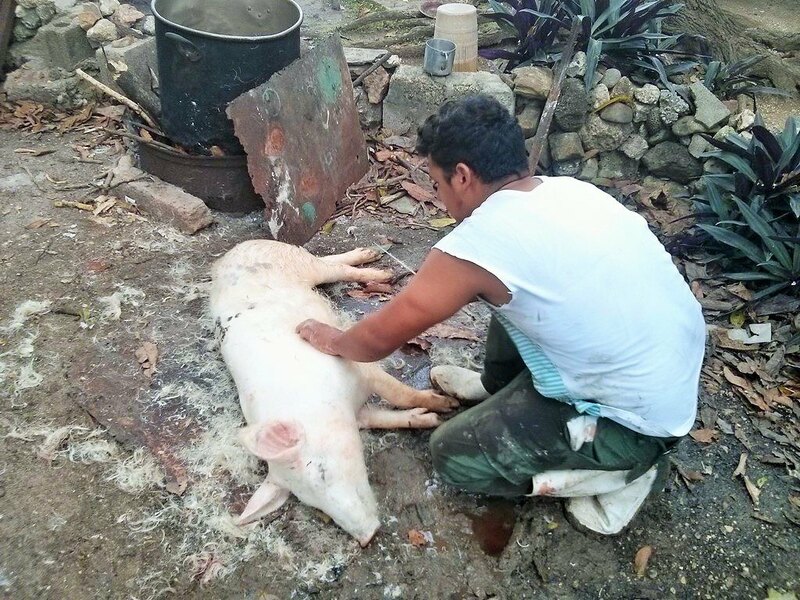 An incision is made in the pigs abdomen and the internal organs are removed. It takes time because you have to make sure not to puncture the intestines. Sanitation is key. We found a large wooden pole and inserted it through the body of the pig. This was laborious work. 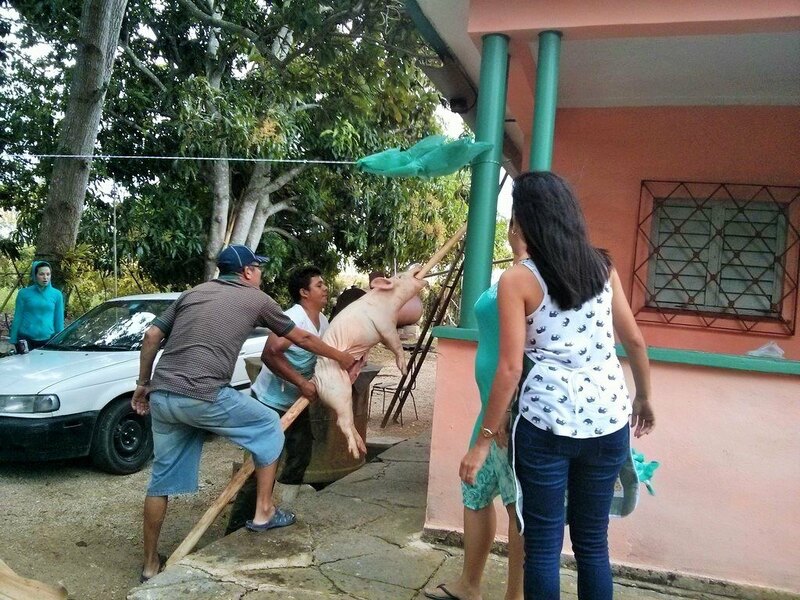 The pig was then secured in place using some banana leaf rope and a few nails. 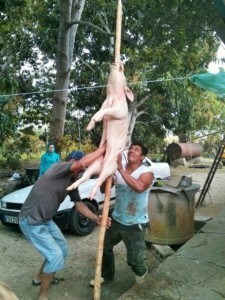 It was very important to secure the pig to the pole as securely as possible. Once cooked, the meat would be very tender and any loose bits could easily break off and fall. The incision in the pig belly was sewn up with some twine. 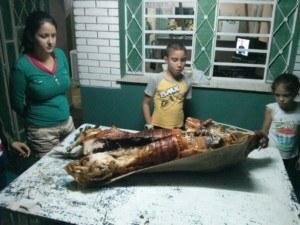 A few limes were sliced and squeezed over the piglet and some salt rubbed on the skin. Honestly, it was very little seasoning. Nothing was put inside the cavity. 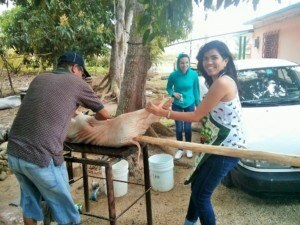 The pig was heavy. It was a delicate operation, but we moved the whole setup over the fire pit without incident. 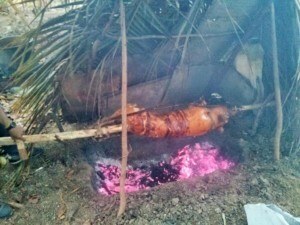 The spit had to be continuously turned for the next 7 hours. Turned by hand, at a rate of about 15 revolutions per minute. We sat there all day, taking turns, turning the pig spit. 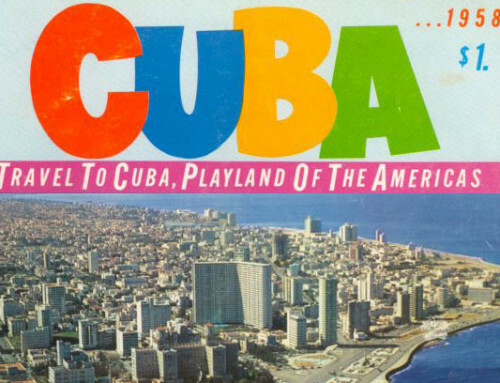 It was not the most fun activity in the world. It was hard work, especially since it was a very windy and not particularly hot day. We added more charcoal every 20 minutes or so. The pit gave off a soft heat, no flames. 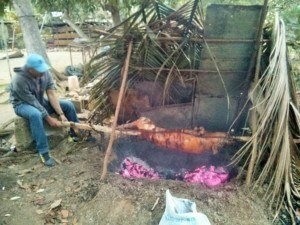 The objective is to cook the pig slowly, in order to get the most tender meat. 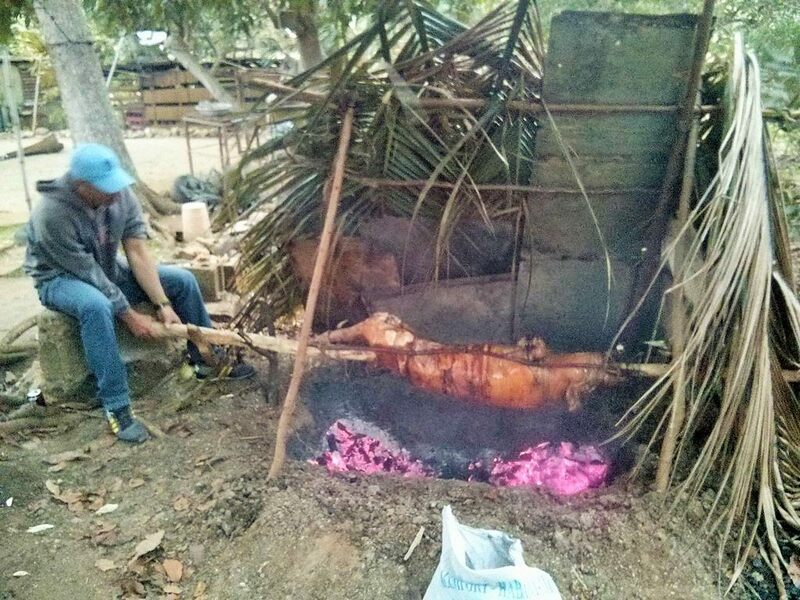 The skin gets darker as the pig is cooked. After about 5 hours some of the skin starts to crack and drip oil. The smell is fantastic. 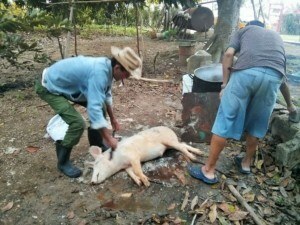 The hind part of the pig is thin, so it cooks first. 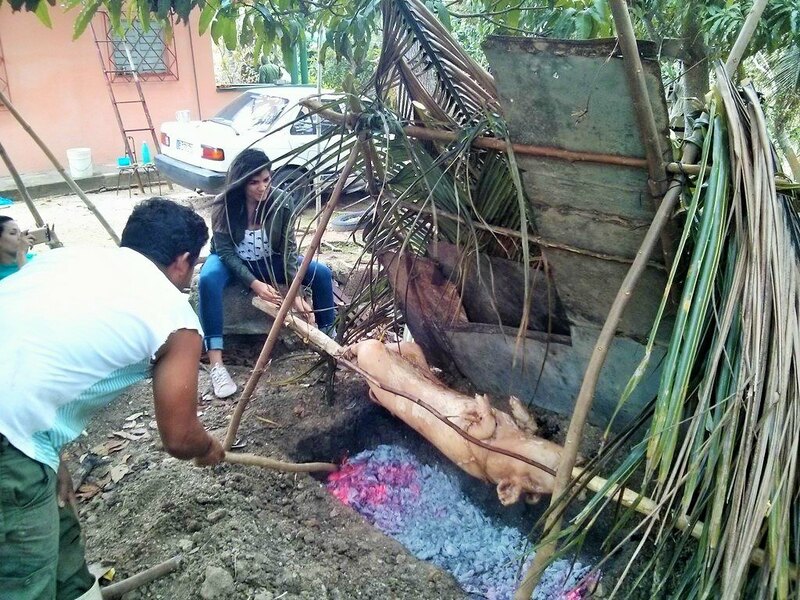 We move most of the charcoal to the front part of the pit so that the pigs chest and upper body could get more heat. 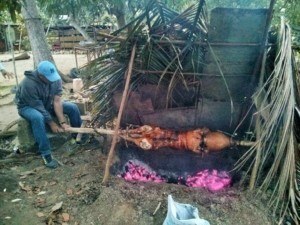 By this time, word had gotten out that we were roasting a pig. The neighbors started to conveniently “pop in” for a visit. 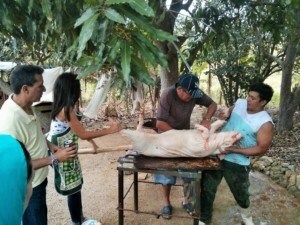 A few local farmers came in from the fields just as the pig hit the table. Everybody was welcome. If we had planned this better, I would have invited more people too. My goal was to have a big meal with no leftovers. 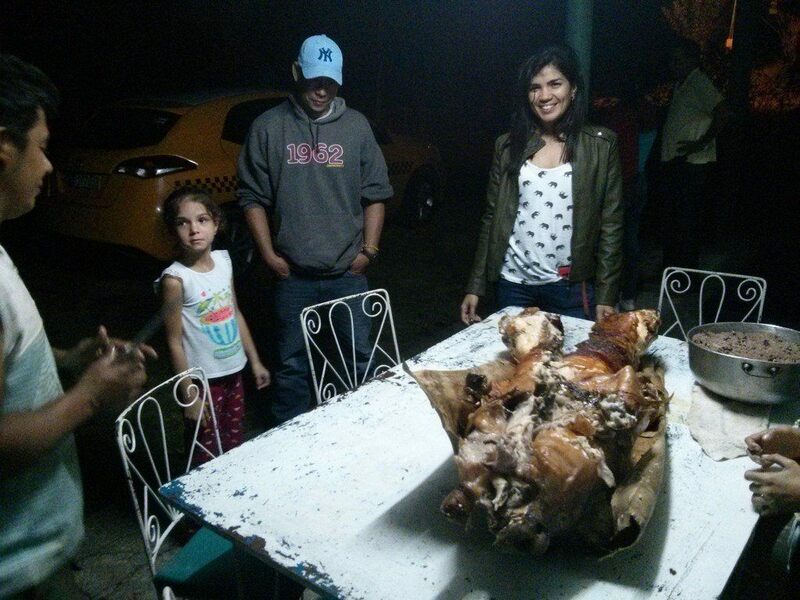 In the end, we ended up having about 20 lbs of leftover pork, but nobody seemed to mind. In addition to the pork, we ate rice and beans and some mighty tasty yucca with mojo sauce (onion, garlic, lemon and oil). The pork was much more delicious than I expected. Almost no seasoning and no sauce. It just tasted perfect and juicy by itself. The meat was tender and dripping with flavor. 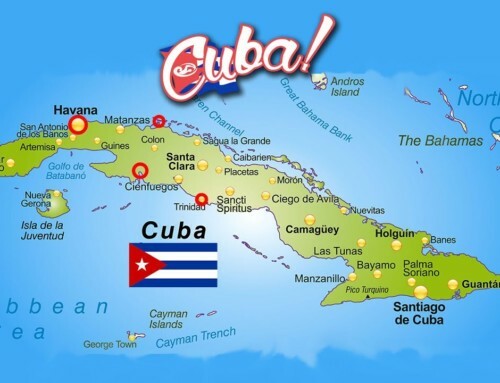 Traditional Cuban food is natural, healthy and pure. 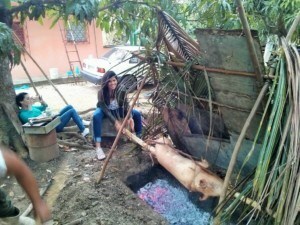 From my many years traveling around Cuba and experiencing the culture, this pig roast was one of my best experiences. 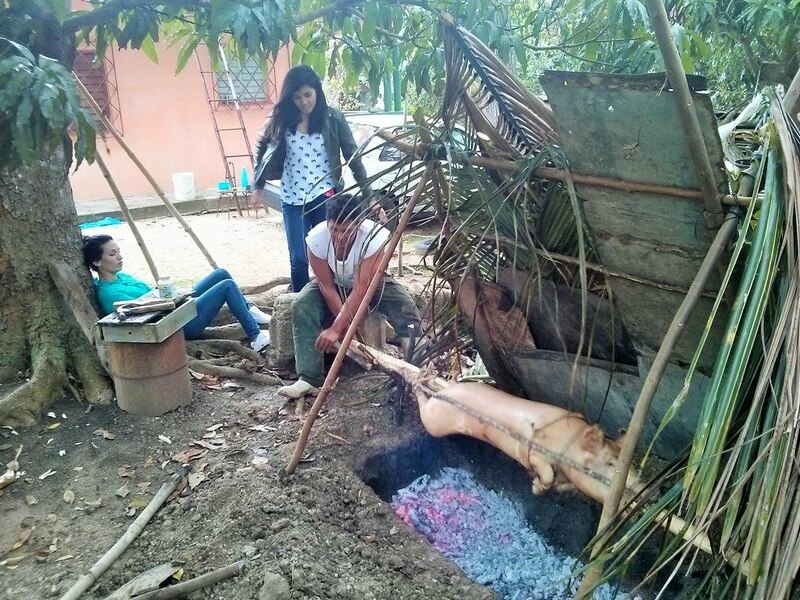 Surrounded by happy people and good friends, the process of taking a whole day to prepare a natural meal, as traditional Cubans would have done hundreds of years ago, slow cooking and talking for hours over an open pit fire… it was a very meaningful experience. 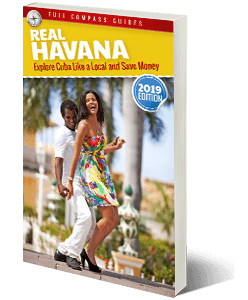 Want to explore Cuba on your own, from a locals perspective? 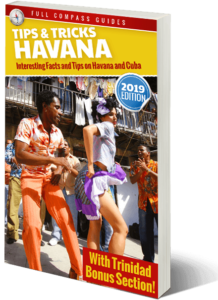 – Learn all about the Real Havana!